On Thursday, Sept. 27, the women faced off against Wartburg College here at home. It was a tough match for them, and the Knights won, 7-2. The two matches that Loras won were the No. 1 and No. 4 singles matches. Sophomore Audrey Hinz, playing at No. 1 for singles defeated Wartburg’s No. 1 6-1, 6-2, giving Hinz her third win at No. 1 this season. First year Mariana Boyana Paez won her first match at No. 4 singles by defeating Wartburg’s No. 4 6-3, 6-2. Sophomore Maddie Smith returns a shot during a match against Wartburg. After their defeat to Wartburg, the women moved on to win against Simpson College in Indianola, Iowa on Saturday, Sept. 29. In doubles portion of the match, the No. 2 team of senior Emma Cooke and sophomore Franny Roche and the No. 3 team of Boyana Paez and junior Meghann Long won their matches 8-2 and 8-3 respectively. Hinz and first year Noely Bauman, the No. 1 team, lost a close match 6-8, making the overall score 2-1. In the singles section, the women won four of the six matches. Cooke and sophomore Maddie Smith, playing at No. 3 and No. 6 respectively, both won their matches 6-0, 6-1. Boyana Paez, continuing as the No. 4 player, won her match 6-4, 6-0. Wrapping it all up was junior McKenna Craff at No. 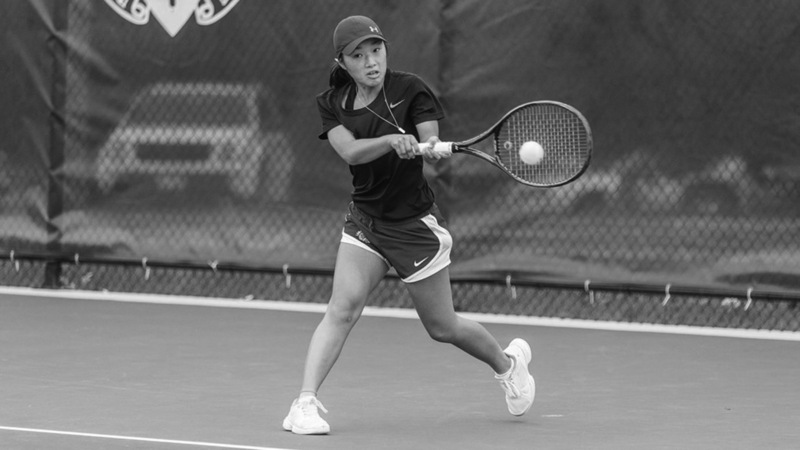 5 singles, who won her close match with the scores 6-4, 5-7, and 10-8 in the tiebreaker. The Duhawks won the match 6-3, marking the first conference win that they need to get into the conference tournament. Directly after their match with Simpson, the women’s tennis players played against Central in Pella, Iowa. Starting off in doubles, the No. 2 team of Cooke and Roche and the No. 3 team of Long and Bayona Paez won their matches 8-5 and 9-7 respectively, allowing the team to move into singles with the score sitting at 2-1. Hinz and Cooke deepened the divide between Loras and Central by winning the No.1 and No. 3 singles matches, bringing the overall score to 4-1. Central fought back though, defeating Long, Bauman, and Smith in the No. 2, No. 5, and No. 6 matches. It all came down to Bayona Paez at the No. 4 spot. She fought hard, but ultimately lost her three set match 6-4, 4-6, 4-6. It was a close match overall, but the Duhawks ended the day with a 4-5 loss. With the one win and two defeats, the women brought their overall score up to 3-6, and their overall conference score up to 1-4. 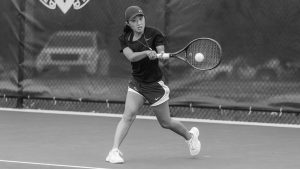 The women’s tennis team may have lost two of their three matches that week, but they did gain one conference win, meaning that they only need two more conference wins to claim a spot in the tournament. Their next matches will be crucial for them. Audrey Miller is a writer for The Lorian.